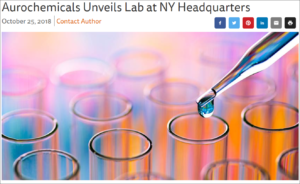 We recently unveiled the opening of our new lab at Aurochemicals! The 1,125-square-foot lab includes equipped countertops, fume hoods and a modern centerpiece lab bench for the preparation and storage of samples, reagents and accessories. Space allocation is given to key pieces of equipment—including the FT-IR, refracto­meter, GC-FID, polarimeter, density meter and melting point apparatuses. The lab also includes a dedicated space for its GCMS, which is used to identify and quantify organic impurities. A specialized retain sample storage ensemble also allows for a systematic slot storage of samples for retain, investigative and stability or shelf life monitoring purposes. The news received some great coverage from Perfumer & Flavorist.